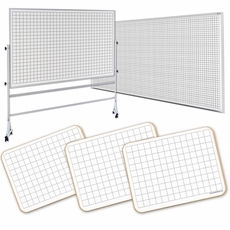 Dry erase boards with grid lines from OptiMA Inc. Dry erase grid boards are awesome tools that you can use in classrooms, the office or on the plant floor. Create your own planning or scheduling boards. 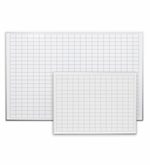 We offer a huge variety of dry erase grid options one of which is sure to satisfy your needs. We have traditional wall mounted framed grid boards that are magnetic receptive meaning that they will accept all kinds of helpful magnetic accessories. We also offer a very convenient printed magnet grid with the same excellent dry erase writing surface as the boards. These 30" x 42" magnets will stick to any existing magnetic whiteboard, chalkboard or any smooth steel surface. 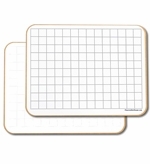 These are excellent if you need a portable grid board or if you're working on a lesson plan where a grid board would be an asset. 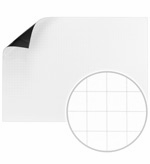 Select from the most popular grid patterns such as 1" x 1", 1" x 2", 2" x 2" or 2" x 3" permanently printed onto the writing surface. Need your scheduling board to be portable? OptiMA also offers a portable grid board. 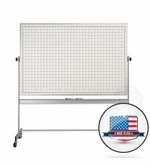 A magnetic receptive, portable and fully reversible dry erase grid board with grids on only one side or on both sides. Another OptiMA exclusive! 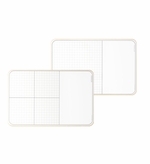 Portable reversible magnetic receptive 4x6 dry erase boards with four grid options.